Brian Landry is looking for a few more men to round out the Doughnut sales teams for 2018-19. If you can help on a Sunday morning once every few weeks, please let him know at 733-1101 or cell 225-9271. The Duties and Responsibilities of Council Officers and Directors are outlined in this brief PDF file. Registrations for Ages 8-15 can STILL SAVE A SPOT and get a $50 discount with Early Registration. $225…Ages 16-17 only and can earn Community Service Hours after Training. Fee include: 6 days and 6 nights, all activities, Kayaking, Archery, Hiking, Shelter Building, food, snacks, lodging, transportation (R/T from Tempe), Campfire and Telescope nights, Forestry Programs, Camp T-shirt, DVD of the week and much more! 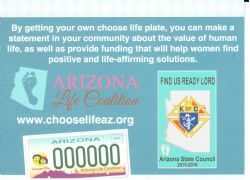 In January of 2009, the Arizona License Plate Commission approved the application for Choose Life license plate after a six-year legal battle that went all the way to the U. S. Supreme Court. Visit www.chooselifeaz.org to read more. You do NOT have to wait until your plate is due for renewal - you can sign up at any time at Service Arizona. effort, enabling us to fulfill our mission of serving families in need. the operations of our House. 2019 Dues are due. Click to Pay Online now. PayPal fees are added to the amounts. Contributions, gifts, and / or membership dues to the Knights of Columbus for unrestricted purposes are not deductible or charitable contributions. You can pay for previous years dues using the Buy Now button below. You can fill in the amount on the PayPal screen. Your balance is shown on your most recent billing notice. You can make payments to the Council for donations, dues and events using PayPal. PayPal is an online payment and credit card processing service widely used by many thousands of merchants and non-profit organizations. It is one of the most popular ways of making online payments. You can use PayPal to pay using your personal credit card. If you have a PayPal account, you can also use it, but you do not have to have a PayPal account to use your credit card. PayPal handles your credit card transaction accurateley and securely using their own secure servers. Our council (or any other merchant) will not see or use your credit card information in any way. You can visit http://www.paypal.com to see more information including Frequently Asked Questions and demonstrations. Since PayPal is a commercial service, they charge us a fee which is passed on to you by being added into the cost of dues or events. This is not done for donations. To make a donation, select an amount, then click on the PayPal Pay Now Button below. You will be taken to PayPal's server. Then you can complete the payment form with your name and credit card information (or log in and use your PayPal account if you have one). After making your donation you are given an opportunity to create a PayPal account but it is not necessary. If you provide an email address, a receipt will be emailed to you or you can click on the "print your receipt" link at the top of the page after making your donation. ns-serif; font-size: 10pt;">The Knights of Columbus has established a Guild to advance the cause for canonization of our founder, Father Michael McGivney. 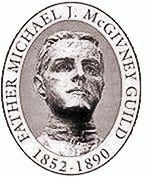 The Guild gathers evidence on Father McGivney's life and character, collects information about favors people have received as the result of Father McGivney's intercession, promotes Father McGivney's cause for canonization, and offers spiritual benefits to its members. To register to join the Guild, CLICK HERE and submit the form. You'll be added to Guild bimonthly newsletter list and kept informed of the progress of Fr. McGivney's cause for canonization. 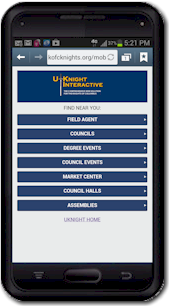 Check back here frequently for updates. Feel free to explore this new site. Some areas, such as the member list, require you to log in. For this you just need your membership number (it's on your membership card) and your birth date. If you have any problems or questions, let me know. Email me at webmaster@kofctucson.org or call me. The attached document has a thorough explanation of the new site. You can download it for future reference. To order Knights of Columbus apparel we have engaged Embroidery for All Reasons to give our Brothers quality merchandise, embroidery and a break in pricing. Below you will find two links: One is for a fillable PDF form that will fill in the pricing information based on the number of items you wish to purchase. The other link is to a form that you can just print and fill in yourself. (In the past some folks have told me that their version of Acrobat Reader does not allow them to fill in the form). Simply fill in the form with your desired items and either give the form to Skeeter at Embroidery for All Reasons, Tucson Bowling Alley at 7020 E. 21st Street, or FAX to 885-5277. Hours are 11 AM - 6 PM Monday through Friday. You can reach Skeeter at 790-3693 for questions.